Willard Scott. Scott is a popular television weatherman and personality. Willard Scott. New York, 1974. 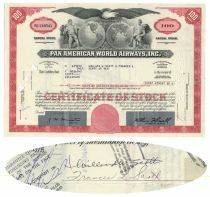 Stock certificate for 100 shares of Pan Am issued to and signed by television personality Willard Scott and his wife on the verso. Facsimile signature of Juan Trippe on the front. Punch and stamp cancelled with the latter affecting both signatures. Fine.